Place 1 medium unpeeled sliced apple in a baking pan. Sprinkle with 2 tbsp of brown sugar and 1/2 tsp of cinnamon. In a frying pan brown 2 pork chops in a little hot oil about 3 minutes on each side. 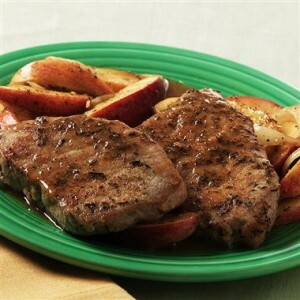 Place the pork chops in a single layer over the apples. Season with 1 tsp of sage. Cover & bake at 350 degrees for 45 minutes.